Long after he played Hawkins in the original, Shane Black (Kiss Kiss Bang Bang, Iron Man 3, The Nice Guys) is returning to the Predator franchise as director and co-writer, re-uniting with fellow Monster Squad scribe Fred Dekker, on the highly anticipated The Predator, a sequel to, and not total reboot, of the classic sci-fi series. 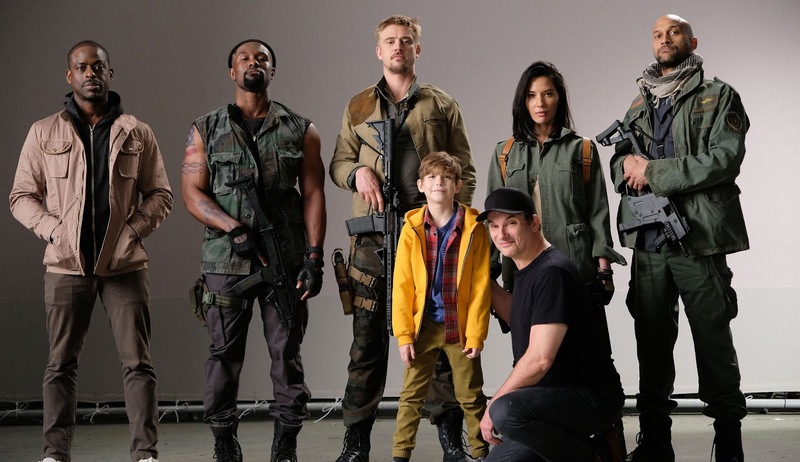 Filming is kicking off today, and Black has shared with us the first lookout the movie’s cast, made up of lead Boyd Holbrook (next seen as Pierce, leader of the Reavers, in Logan), Olivia Munn (X-Men: Apocalypse), Keegan Michael-Key (one part of comedic duo Key & Peele), Trevante Rhodes (Moonlight), Sterling K. Brown (The People vs. O.J. Simpson), and Room’s Jacob Tremblay. Missing from the image is The Punisher himself, Thomas Jane, whose involvement was announced few weeks back. No reason is given for the military garb, but Shane has said the characters will have the same make-up as the first movie, so I think we can expect our favourite alien big game hunter to once again be taking on the power of the military. The Predator is set for release February 9th 2018.